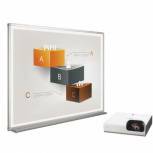 Bi-Office Bi-Bright 72in Whiteboard and Short Throw Projector Presentation Bundle BBS1891235 Pack of 1 Complete presentation kit for business use. 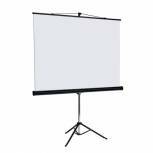 Includes 72in whiteboard (1600x900mm) and WXGA (1280x800 pixel) Sony short throw projector. Integrated 16W speaker. 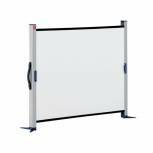 Nobo Portable Desktop Projection Screen 1040x750mm 1901954 Pack of 1 Easy to set up desktop projection screen with 125cm diagonal viewing area and flame retardant matt white surface. Ultra lightweight aluminium construction. Robust integrated carry handle. 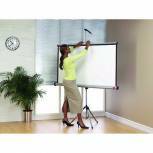 Nobo Floor-Standing Portable Projection Screen 1620x1220mm 1901956 Pack of 1 Easy to set up floor standing projection screen with 200cm diagonal viewing area and flame retardant matt white surface. Ultra lightweight aluminium construction. Robust integrated carry handle. 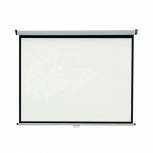 Nobo Wall Mounted Projection Screen 2000x1513mm 1902393 Pack of 1 Wall screen designed for DLP/LCD projector use. With a smart Black border and wall or ceiling mountable using the two-way end cap brackets. Ideal when a permanently fixed screen is required. 2000 x 1513mm. 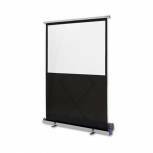 Nobo Wall Mounted Projection Screen 2400x1813mm 1902394 Pack of 1 Wall screen designed for DLP/LCD projector use. With a smart Black border and wall or ceiling mountable using the two-way end cap brackets. Ideal when a permanently fixed screen is required. 2400 x 1813mm. 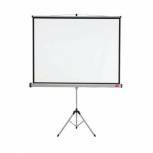 Nobo 4:3 Tripod Projection Screen 1750x1325mm 1902396 Pack of 1 Tripod screen designed for DLP/LCD projector use or OHP use. With a smart Black border for a professional, sharp-edged image. Ideal if wall space is limited, or if you want to position the screen in different places around a room. 1750 x 1325mm. Nobo 4:3 Tripod Projection Screen 2000x1513mm 1902397 Pack of 1 Tripod screen designed for DLP/LCD projector use or OHP use. With a smart Black border for a professional, sharp-edged image. Ideal if wall space is limited, or if you want to position the screen in different places around a room. 2000 x 1513mm.